This week we’re hearing from Frieda Koper in Anchorage. 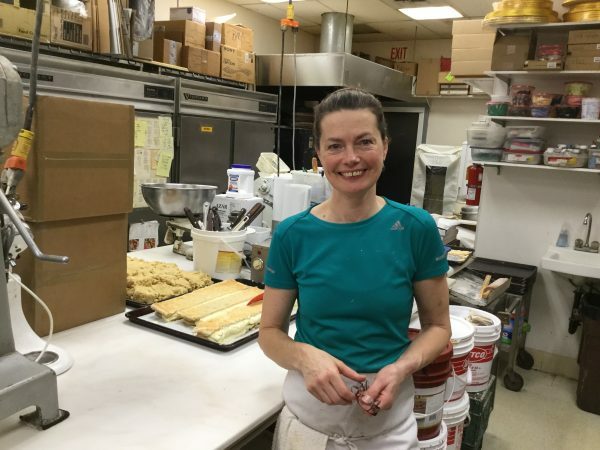 Koper owns the Flying Dutchman pastry shop, a family business that’s been around for 36 years. The year that they started the shop was also the year he got his private pilot’s license, so the name “The Flying Dutchman” was a play on that, along with the history of the lost ship and the story behind that. So “The Flying Dutchman” was kind of a twofold of history. And that’s how it started back in 1982. You know, Europeans, the borders are much more open, the countries are so small, everybody crossed borders, the traditions go from generation to generation, so we have people come in asking for just a Dutch pastry or just a Swedish pastry. What we have found, the best answer is, if it has almond and if it has butter, it’s European. Those are kind of the requirements. In cakes, butter and whipped cream, and not too sweet. That’s a big thing. Not too sweet. The tarts are probably our biggest seller, as far as people coming in. They’re a nice variety of different flavors. You know, almonds, fruits, nuts. So it’s a nice way to get a variety of flavors and get the almond and the butter. This time of year is the quieter time for us. Everyone has their New Year’s resolutions, they’re all going to lose weight. We usually find that lasts a couple of weeks, and then people start coming in again. But we’ve been still very fortunate, people keep coming and finding us, and every time, we’re grateful for that. I have so many people that tell me, “I love to bake! I love to bake! I want to have your job,” and I say to them, “If you love to bake, don’t open a pastry shop.” Because it’s not about baking, it’s about paying the bills. It’s about making the responsibilities. It’s about getting up. I love my horses, so I don’t do horses for a living, because I can go home and enjoy my horses and my dogs.